For all my natural beauties out there, I have wonderful news! Yesterday I met with Ariel, the creator and co-owner of the amazing Treat Yourself Inc. natural beauty and skincare product company (we studied together at the California School for Herbal Studies years ago!) and since I’ve been passionately loyal to these products for several years now, we agreed on a DISCOUNT CODE for my holistic wellness clients and now I’m able to share it with ALL OF YOU! Ariel was a pre-Med student who realized after receiving her undergrad degree that she did not want to dedicate her life to a career that would pressure her to push pharmaceutical drugs onto people (doctors have quotas from drug companies!) and she didn’t want to be in a profession where she could spend up to ten minutes with a patient. She then decided to use her knowledge of health and medicine to bring natural healing skincare and self-care products to women everywhere! She also decided she would make them herself, by hand. She originally started creating and sharing product recipes – and the people spoke – they wanted her to make all of them for her! Once you try them, you will see why this was absolutely imperative. Ariel personally selects, sources and creates each batch of her organic beauty products: skincare, oral care, and natural deodorant. She uses absolutely ZERO chemicals – zero additives – and there is not a single amazing, organic ingredient without a very specific and special purpose. Like the cloves in the tooth powder for oral sensitivity! More on that, below. 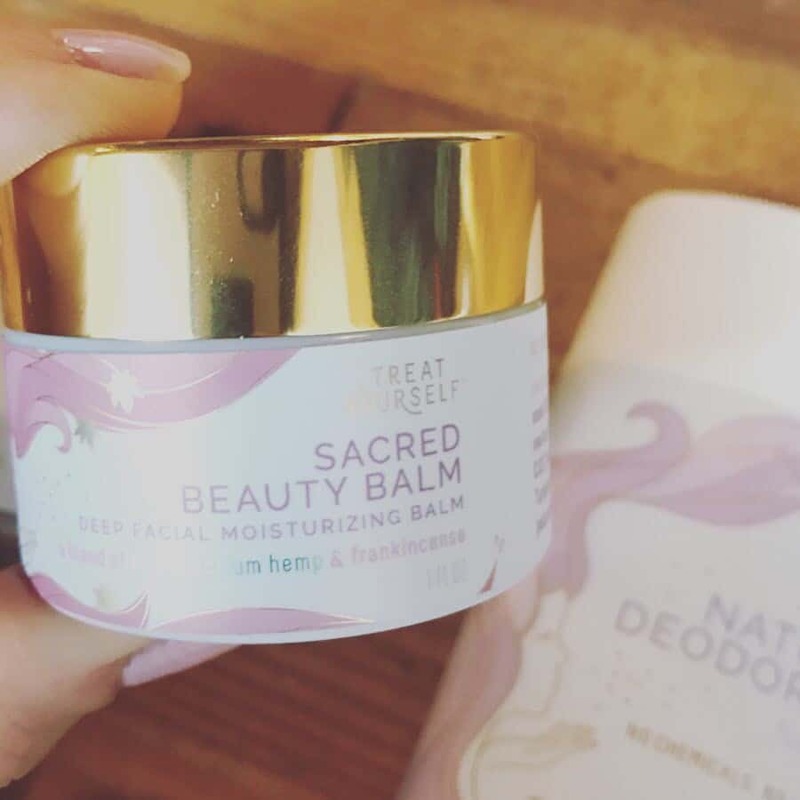 The beauty balm is basically liquid silk. The Aloe Glow is basically liquid gold. The tooth powder is shiny white teeth in a few easy swipes. I pour a little dab of the tooth powder into the palm of my hand, wet my toothbrush and scoop it up and into my mouth. I can tell you right now, I will never go back to regular toothpaste (have you seen the cancer research on Colgate?! ), regular moisturizer or deodorant. Watch your skin glow and transform even in the winter, and the stains disappear from your teeth while turmeric and frankincense reduce inflammation. As we know, oral health is directly linked to heart health. I’m telling you, this stuff is MAGICAL. Enter WELLNESSA20 at checkout for 20% off their already reasonable prices. It makes me so happy to make all natural beauty accessible to women everywhere!! They all make great gifts and stocking stuffers for moms, daughters, and friends too. The mud veil is always a fun one to do together. The renegade sage is the perfect natural deodorant for men – no more chemical burns! For the last few years, my absolute favorite skincare product is the Aloe Glow, which has these gold flakes in it and nothing makes my face look brighter, except for maybe the Sacred Beauty Balm, which feels like liquid silk. The beauty nectar is incredible, too. In some of the versions, she uses full spectrum hemp – not isolate, so it includes the plant constituents. It’s an anti-inflammatory that evens out redness, scars, and turmeric extract is amazing! Naturally balancing out the complexion, especially in cold weather. It sinks in well at night, as it’s a rich cream and absorbs really well with a mango butter base that’s not oily and noncomedogenic, so will not clog pores like Shea butter! Ariel purposefully uses a pure rosehip CO2 extract with vitamin A that is actually red instead of clear and lasts longer. If that excites you, try the Rosehip Dream Cream! Cold pressed oils can be oxidized, old products on shelves become rancid. These are stable and maintain their properties! I really like the toothpowder with frankincense and myrrh. It has activated coconut charcoal from coconut shells that is whitening and absorbs toxins from the mouth and stains from the teeth + detoxifies. There’s calcium bentonite (not sodium!) so your teeth get the calcium. Turmeric is not seen in a lot of toothpaste – it whitens and is anti-inflammatory for gum health, like a turmeric mask for brightening the skin. Clove is analgesic for pain and sensitivity! It includes cinnamon, which is antiseptic and for flavor. Of course, there is NO SWEETENER. Yay. If you prefer a minty flavor, try the spearmint. I love their deodorant and have used it for years and I should mention that she sources her beeswax from a small farm, so it’s pure and sweet-smelling (no smoke in the hives), but it’s not technically vegan because the bees made the wax. The deodorant incudes naturally absorbent arrowroot powder to keep you dry. I love the pink zest (which smells like sweet grapefruit) and the Full Bloom, which has jasmine and lavender. The Mint magic is for men or women, and so is the Renegade Sage! No more underarm burn marks for men or women from all the chemicals. Make it an extra healthy holiday and new year for you and your loved ones! Go to https://treatyourselfinc.com and enter “WELLNESSA20” at checkout for 20% off.